True fall is approaching in Wisconsin. The time of delicious pumpkin spiced drinks, chilly mornings, and apple picking. But until it actually arrives, we have come to that tricky transitional period. It can be hard to dress for slightly chilly mornings and warmer afternoons, especially if you want to delve into your fall clothing and layers. There are some great ways to navigate these few transitional weeks seamlessly. 1. Booties are your friends. They don't cover enough to be too warm, but still have the fall flair. Booties with cut outs are especially perfect for this time. 2. Show some ankle while you are at it. Roll your jeans up. The pants will cover enough of your legs in the morning or on cooler days. Still worried about the warmer temps? Go for a distressed look! Think of them like pants with vents built in! These distressed jeans are so lightweight and stretchy. They will be easy to wear well into fall. 3. Wear traditional fall colors. This burgundy top from SheIn is perfect for transitional fall dressing. Its burgundy color works, but it is still short sleeved so it doesn't get hot. I love the neckline detail, too! 4. Add fall accessories. 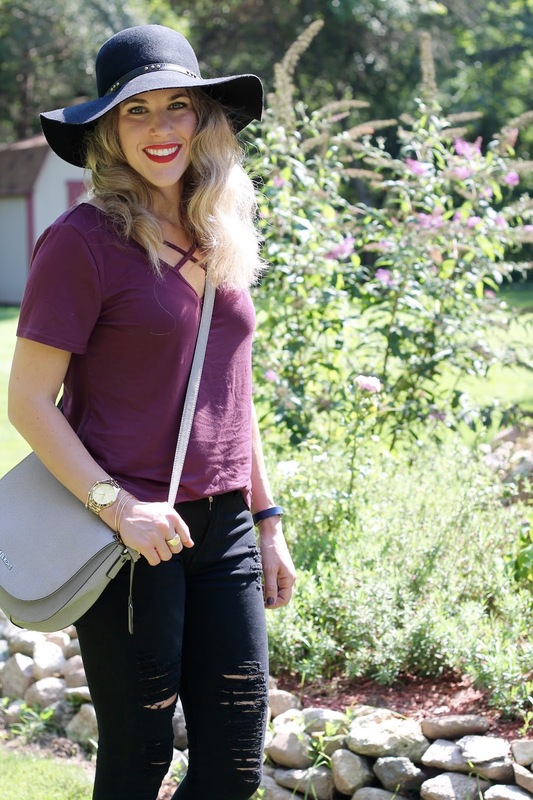 This hat screams fall and definitely adds that vibe to this outfit. Even adding a similar hat to a summery dress helps to transition it to fall. Love the deeper rich colors of fall! I love tees with neckline details that make them stand out! I totally agree with you, color is the easiest way to get some Fall in your wardrobe since it's such a strange time of year temperature-wise. Just adore that beautiful plum color on you! Love the pants and top together! I just ordered my first pants from Shein (somewhat like this too) and I can't wait to see how it fits me! That plum top is so pretty! Love the criss cross detail! I love this color on you Laura! Such a great casual look and love the hat. Thanks for the link up! So comfy and stylish look! Loving this outfit, lady- super cute but still comfy! 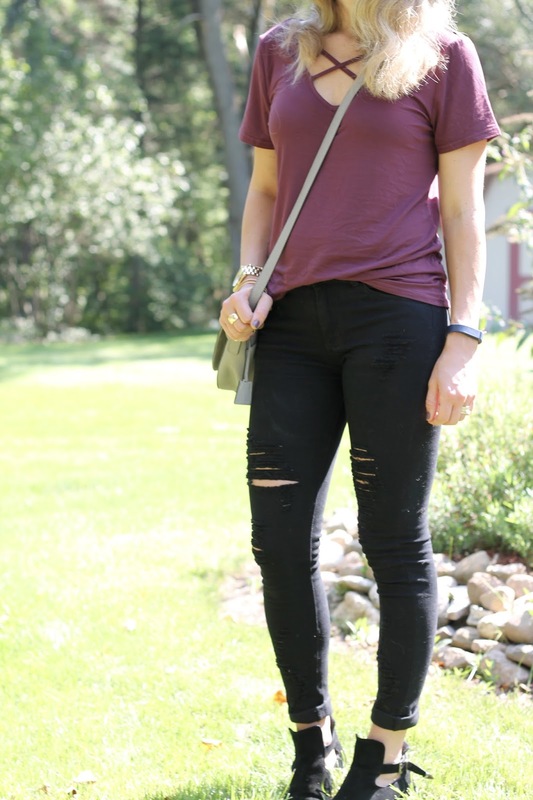 The burgundy tee is so Fall-perfect! So cute!! I need to get that hat already! Such a fun look!! the hat is a perfect touch ... and I've been enjoying the distressed jean look myself ... loving yours!! Adorable look and bag Laura! I hope you have a great Tuesday. Okay this is the perfect fall outfit! I love your color combo. The distressing and lace up are such great details. 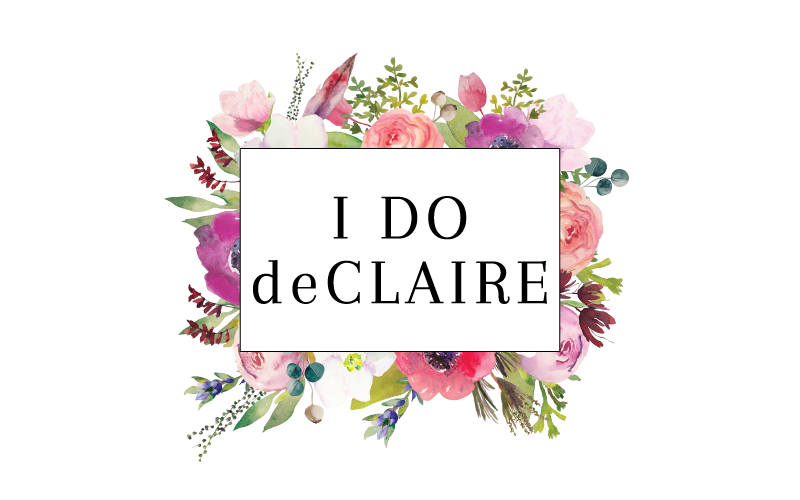 You are so fall ready! I love the pretty color of that saddle bag too! 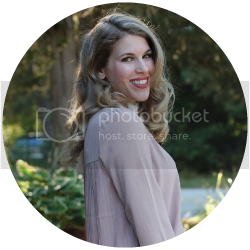 Love the neckline of this top, great fall look on you! I absolutely love that top! It's perfect for this time of year! I am so in love with these criss cross tops lately!! Love this and the color is gorgeous! Beautiful Fall look! Well, you really hit the nail on the head with these thoughts!! I've been wearing my ankle boots a ton lately for this exact reason! I do love the chill in the air in the mornings---it's a nice change, and I love being able to grab a jacket for warmth!! I LOVE LOVE LOVE this look on you Laura--I think it's one of my favorites. 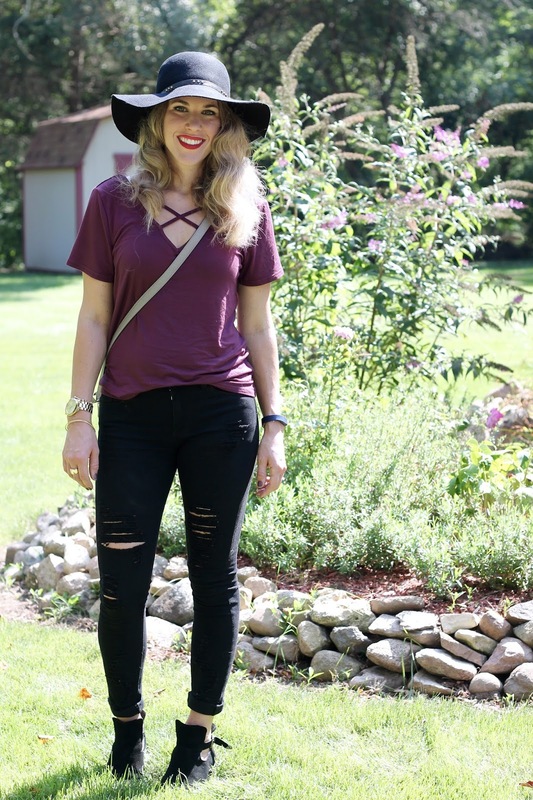 That criss-cross top is so fun, and I love how you styled it with the distressed jeans, hat, and booties. You've got this badass, boho vibe going on that I'm loving. Love this look on you! I totally need a tee like that. I love the style and color of the top. It is perfect for transitional weather! You also look fab in a hat; I wish I could rock one. 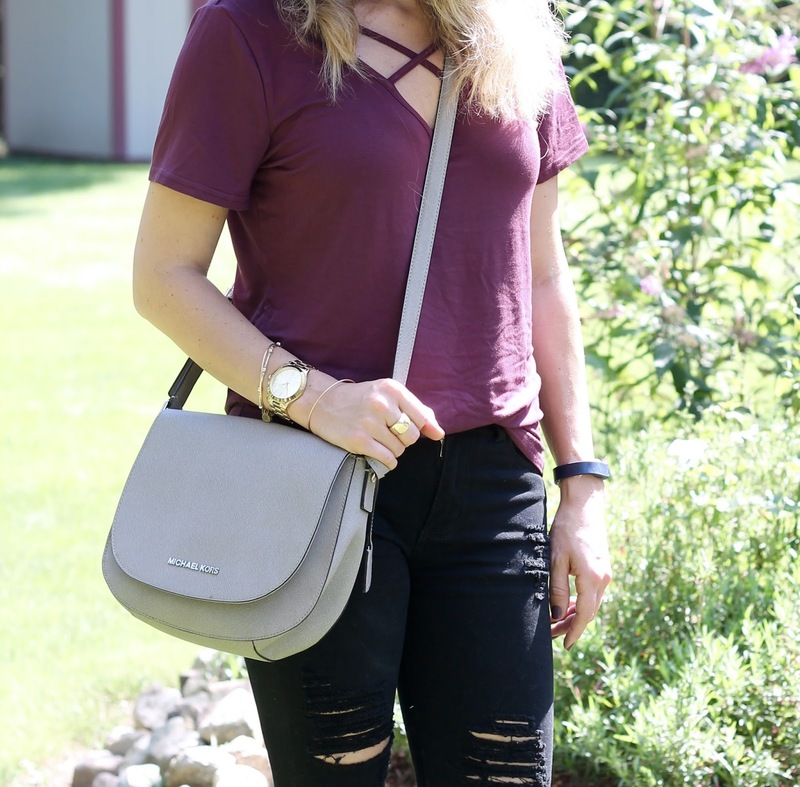 I really love those distressed jeans, and your bag, perfect shape and perfect color - I'd say perfect fall color but really that is wonderful for every season. I love the criss cross detail on the top. Very nice fall look for warm afternoon! I love the top - great details and color! Beautiful, rich colors! I enjoyed your practical tips for transitioning. Fall colors are definitely my favorite way to get into the fall look. I love the front detail of this top! such a cute outfit!!!! Love the hat! I love the distressed jeans! Great look for Fall! Your jeans add a bit of edge to the outfit and I love it! Love this fall look, makes me even more excited for the season!! Such a great look! I love this top and jeans! I'm in love with that burgundy top on you! Such great tips, and a perfect transitional fall look! 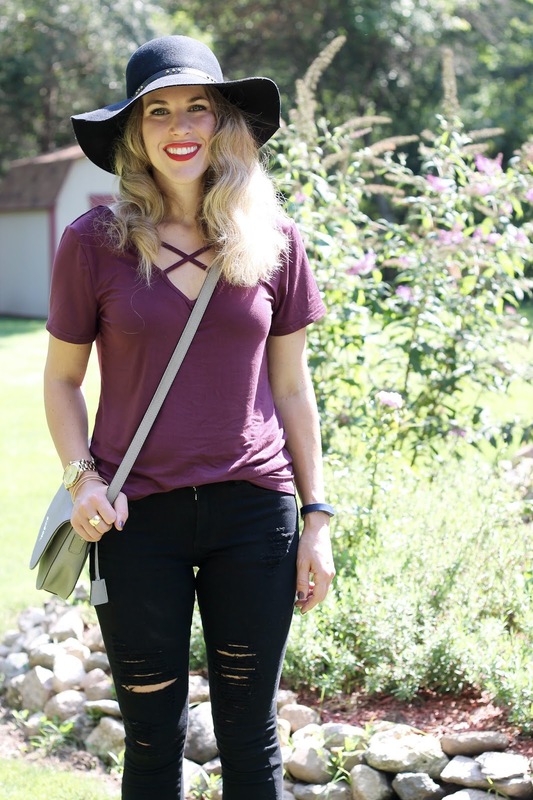 That plum top is just the perfect color for fall! I just purchased a plum colored tunic from Stitch Fix and I am in love with that color right now (I even have plum colored nails! lol!). I love it with the black distressed jeans (which look great!) and that black hat! Such a perfect outfit! Burgundy always gets my vote for Autumn and Winter - wear it alot as it's such a flattering colour and this top is even sweeter with the criss cross at the neck. Wish I could wear floppy hats but sadly my head is so small they fall over my eyes! Love the whole outfit any time of the year, but absolutely perfect for fall! This whole outfit is perfection- I need those jeans! Oh, I love the criss cross detail on this top! And in the perfect burgundy shade for fall, too! I wear tees a lot but really like the extra pizzazz at the neckline of this tee. Bumps things up a notch. Your transition tips are just what I needed to read. Accessories are a great way to begin incorporating fall into our wardrobes. Time to dust off my booties, too!